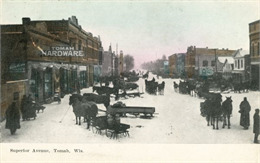 Superior Avenue, Tomah, Wisconsin, 1905 ca. The city of Tomah is located west of Fort McCoy near Lake Tomah in Monroe County. Founded in 1856 by Robert E. Gillett and his son Robert A. Gillett, Tomah was named for a legendary Native American chief named Thomas Carron (1752-1817) who built a council house where the Menomonee and Ho-Chunk met. The site of significant lumber and railroad industry, Tomah later became a center of agriculture, especially cranberry growing. Tomah is known as the boyhood home of Frank King (1883-1969), creator of the popular “Gasoline Alley” comic strip, and John E. Sheridan (1880-1948), illustrator of numerous Saturday Evening Post covers. See more images, essays, newspapers, museum objects and records about Tomah.